If you get my newsletter (What?! You haven't signed up yet?!?!) then you already know what new books I'm working on currently. Here are some sneak peaks of the art. I'm taking over art duties on the new Origins series for IDW. Fun stuff! I'll be doing line art and colors on the five issue series. I did an issue featuring the tribbles! My follow up book with UMBRA writer Steve Murphy. This one you already know about (if you follow the blog or newsletter) but here's another sneak peek anyway. 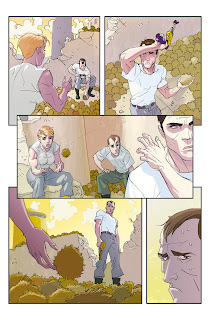 You can also sign up for my newsletter at ThinktankComics.com by entering your e-mail into the newsletter field under the "About Mike" section. You can also check IDW Publishing's site for more details. CONGRATS!!!! Glad to see you got some nice gigs lined up. And pretty darn cool that you'll be handling the coloring on the GI Joe stuff. Think that you'll be able to control the total package on art much better. Congratulations on the G.I. Joe gig, and the Trek book! 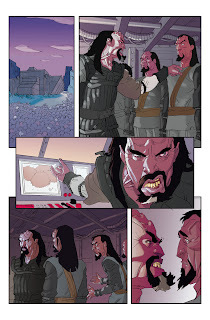 Love your Klingon rendering -- you actually make those goofy latex foreheads look good.